I wore my Prime Factorization Sweater to KidlitCon09, and it shows up in all my pictures, so I think it’s time for me to explain it. Okay, here’s how it works. You have to start in the bottom lefthand corner, because the mathematician in me couldn’t bear to start anywhere except where the origin would be on Cartesian coordinates. Naturally, the numbers go from left to right and from low to high. Okay, look at the bottom row. It looks like there is a blank space on the left. That represents 1, because 1 is the background color, because 1 is a factor of every number. Next is a blue square, which represents 2. Next is a red square, for 3. Then comes 4. 4 = 2 x 2. So 4 is represented by two blue rectangles. Then comes 5. 5 is prime, so 5 gets a new color, yellow. Next is 6. 6 = 2 x 3. So 6 is represented by a blue rectangle and a red rectangle. 7 gets a new color, purple. 8 comes next. 8 = 2 x 2 x 2. So 8 is in a square with three blue rectangles. Then comes 9. 9 = 3 x 3. Two red rectangles. Last on the bottom row is 10. 10 = 2 x 5, so we have blue and yellow. The second row starts with 11, which is given the color pink. 12 has three factors, since 12 = 2 x 2 x 3, so two blues and a red. Get the idea? 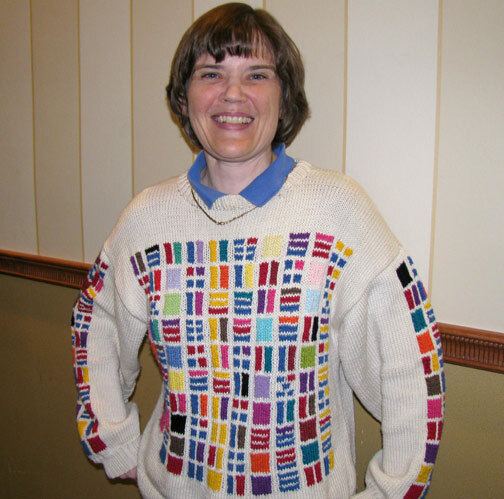 This sweater presents a chart giving the color-coded prime factorization of every number from 2 to 100. The patterns are wonderful and fascinating. You’ll quickly notice that the yellows and the blues line up, because 5 and 2 are factors of 10. You also might notice that all perfect squares are symmetrical. Multiples of 11 go in a lovely pink diagonal across the sweater. There are hundreds more patterns. It would be a lovely visual aid for teaching number theory. Fun to quietly wear to Math competitions, too! The fun thing about rows of 8 is that the patterns are all different! Notice how the last column is full of blue squares because every number there is a multiple of 8 and has at least three factors of 2. And now 9 (two reds) acts like 11, going diagonally up the sweater, as does 7 (purple) in the opposite direction. On the sleeves, I did rows of 2 and rows of 3. The rows of 3 is the only one where the blues do not line up, because 2 and 3 are relatively prime. Isn’t it just the coolest thing in the world?!!! Okay, I warned you: This is the item that proves I am a Certified Math Nut. 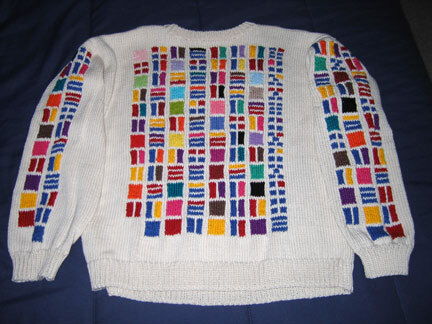 I can get hugely excited and animated talking about this sweater. 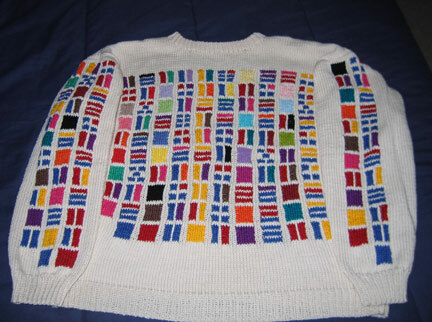 I have already done a library program called “Puzzles and Patterns” showing kids how they can make simple codes using the ideas from this sweater. There’s definitely a children’s book in there, but I haven’t gotten around to writing it yet. I definitely plan to some day! One of the cool things about this sweater is that it works in any language and on any planet!!! You see, even if an alien race had only four fingers on each hand, they could look at the back of the sweater and all their numbers would work. For that matter, a number system with a base of 7 or some other strange base would still work, even though it might not be in neat rows for that base. The chart is entirely independent of the symbols used to represent a number, and based only on color. I only hope the aliens are not color blind! What can I say? He does have a point. Call me weird, but I still think it’s one of the coolest things in the world! Edited to add: Here’s a link to my CafePress store, where you can order t-shirts using this idea, showing the color-coded prime factorization of the numbers from 2 to 100, with the number also printed below the color-coded square. Also, here are all my entries about other prime factorization projects. This entry was posted on Tuesday, October 20th, 2009 at 11:44 pm and is filed under General, Knitting, Mathematical, Prime Factorization. You can follow any responses to this entry through the RSS 2.0 feed. You can leave a response, or trackback from your own site. I love this! I’m planning a quilt for my grandson (age 11) who loves math; something like this would be perfect! Thank you. Lovely! You can do the same thing with small pieces of color — should be easier than knitting it! 🙂 Yay! Wow, what a wonderful sweater! I admire how you visualised this, your knowledge and dedication, and the way you give it a personal touch. And then you took the time to share it online, which is even more awesome! This is a work of art! Wonderful! Leif in the comment above just sent it to me and I am fascinated! And you have a great sense of humor!